As we can see in the above chart, this ETF has performed horribly since it first began trading losing -38% in the past 5 years. If you would have simply put your money in SPY, a much less riskier ETF that tracks the S&P index, you would have realized an +89% return instead. The opportunity cost of investing in LIT is huge since a 5-year investment of $10,000 would be worth $3800 if invested in LIN or $18,900 if invested in a simple S&P tracker. The three largest lithium producers are the Chile-based Sociedad Quimica y Minera (SQM), American FMC Lithium (FMC), which controls the ominously-named Hombre Muerte mine in Argentina, and Albermarle (ALB), which recently acquired competitor Rockwood. Albermarle is developing lithium brine holdings around Magnolia, Arkansas—the only American deposits that Anderson allows might make economic sense in the near future. Together, these three companies provide more than 90% of the world’s lithium, and have absorbed much of the rising demand simply by bringing untapped capacity online. The problem is that none of these companies have performed very well with the motif losing -30% in the past year. The “world’s biggest lithium producer” SQM is actually the poorest performer of the bunch having lost nearly -50% in the past year. A key reason for this is that lithium only contributes 11% of revenues for SQM so the actual exposure you get to lithium is very small. For FMC the exposure is even worse. Lithium sales contributed just 6% to FMC’s revenues. ALB fares slightly better with lithium contributing 13.6% to total revenues. It’s difficult to get direct exposure to lithium through the stock market since 90% of the world’s lithium is produced by companies for which lithium is a small part of their operations. Additionally, not all lithium is created equal. Panasonic, who supplies Tesla with lithium batteries, is said to be looking to China for a solution to their increased demand for high-grade lithium for batteries. Investors who are bullish on the price of lithium because of the “lithium battery story” are best off looking at other ways to play the story such as battery manufacturers. Any lithium “junior mining stocks” with promises of “valuable reserves” trying to ride on the coattails of Tesla should be avoided like the plague. In a coming article, we’ll take a closer look at lithium battery manufacturing companies and also break down the composition of the Global X Lithium ETF (LIT). Did you have some names in mind? We’ll gladly take a look at any junior miners that are trying to attach themselves to the Tesla story. I’m completing a compendium of lithium bearing pegmatite projects worldwide and if you agree, I would like to include a description of your project. Perhaps I would be able to attract an investor for you. Biggest producer of Lithium is Australia, so it would be wise to have a look at companies around existing and old mines in this area. All ASX listed, AJM, PLS, NMT, DKO, CXO, GXY, GMM. Massive gains. Lithium X Energy. Monday morning quarterbacking here, but since this article was written the price of Lithium has more than doubled, and Lithium X Energy has gone from .04 cents to just shy of 2 bucks. Even the crappy LIT ETF is up a little. My take on this is that the Lithium rush which started 5 years ago was obviously way too early. And this rush may STILL be too early. But, in all likelihood Lithium WILL go parabolic eventually. If you can find a well run new player like Lithium X, get in super cheap, and are willing to sit on it for up to ten years, it could make you rich. I personally am already playing with house money on Lithium X, so I’m willing to set it and forget it. I’m hoping for a major (25+ bagger) explosion in the next 3 years, but I’ll wait 5 or 10 if that’s what it takes. I’m also in Uranium and Solar. They are all long term speculative plays, but they have the potential fort quantum gains. Alternative energy (including Nuclear) is an unstoppable trend. But especially for Lithium, it’s not a matter of if, but when. A major disruptor like Nuclear Fusion, or some completely new kind of battery would have to come along in order to disrupt the burgeoning Lithium market – a market that is poised to grow exponentially over the next decade. Thank you for the comment Rich. Do you have a verifiable source for the price of lithium? It’s one thing we can’t find and nobody has offered up. Regarding Lithium X, I believe that is one I saw being hyped over at Investors Hub ADVN. The idea of sitting on a penny stock for ten years to get rich is exactly when we tune out. Perhaps the best thing to do in order to gauge what lithium is doing is to watch what the big-3 producers are saying. We’ll pore through their financials one of these days to see what impact the lithium hype is having on their revenues. That will be very telling. Lithium X didn’t go from 4 cents to $2+…..it only just started trading after a reverse merger and began trading around 40 cents, still its almost done as well as CYNK did a year or so ago. Avoid Junior minors like the plague that are mentioning Tesla? Why does the sentence stop there? It would be good to back up a statement like that with some reasoning? That statement implies that junior lithium minors are fraudsters. I clicked on this article thinking there might be some good reasons not to invest in pure play lithium juniors. No, nothing. I am off to invest in Lithium X. Also stating that sitting on these types of stocks for ’10 years’ before seeing returns is way off. It’s more like 2-3 years, and at worst 5 years, definitely not 10. Thank you for the comment Norris. Another example of an activity that skirts the borderline between legitimate promotion and hype is the case of LEXG. Described (but perhaps overstated) as “the biggest stock promotion of all time”, Lithium Exploration Group’s market capitalization soared to over $350 million, after an extensive direct mail campaign. The promotion drew upon the legitimate growth in production and use of lithium, while touting Lithium Exploration Groups position within that sector. According to the company’s December 31, 2010 form 10-Q (filed within months of the direct mail promotion), LEXG was a lithium company without assets. Its revenues and assets at that time were zero. Subsequently, the company did acquire lithium production/exploration properties, and addressed concerns raised in the press. We’re old school when it comes to an investment horizon and like to believe that any good investment historically that made many millionaires, did so over decades and not years. We appreciate the engaging comment! Have a look at Rare Earth Minerals (UK .AIM: REM) and their JV partners Bacanora Minerals (Uk.AIM : BCN). The Sonora Lithium project will rival anything in the world in the next couple of years. Thank you for the heads up. We’ll take a look! Cool, Mexico certainly needs that. I agree with the comments above; topcat14 is quite right to suggest Bacanora Minerals (BCN) and venture partners Rare Earth Minerals (REM). Their joint venture in Sonora, Mexico already sounds very promising indeed with still many more areas to drill and explore. Sonora has lithium based clays that will be easy to mine, relatively easy to extract the lithium and importantly, very scaleable to cope with changes in demand. Nemaska Lithium (V.NMX ) looks promising. FEA approval last week and full permit expected any time this month to develop $500m high grade 3000 tonne per day lithium mine. Expected pay back 3.7 years. 28 million tonnes measured & indicated. Eligible for funding support from Quebec government’s $1bn Plan Nord initiative. “The likelihood is that Tesla and its peers will help Nemaska and other lithium hopefuls with up-front capital in return for certainty of supply, and that dynamic means that the usual market uncertainty about any given company’s ability to secure development funding are greatly mitigated. At UK broking house SP Angel, Bonnie Hughes points out that Tesla has undertaken to source all of its raw materials from North America. Thank you for the comment. We’ll take a look at the “Tesla thesis” in a future article. It’s a very interesting idea but the “likelihood” of Tesla fronting capital to junior lithium companies seems very low. Prior to even breaking dirt on the Gigafactory, you would expect them to have already secured the raw materials needed for production. Not doing so would be poor planning. Here’s the article as promised! Orocobre has a strong exposure to lithium. A rising star in the Lithium arena would have to be a junior West Australian mining company ‘Pilbara Minerals Ltd (PLS)’ with what is purported to be the second largest Hard Rock Lithium discovery in the world. BCN & REM Sonora project sign supply deal with Tesla, announced this morning. Oh dear, you didn’t see that coming (but I did!). Do you get paid for publishing nonsense? Hi Ray. Can you please point us to the article you published which predicted that Tesla would sign a future supply agreement (not an investment) with BCN & REM? Bacanora and REM Plc London are sitting on the works largest lithium deposit and they are in clay on the surface. Pilot plant has already produced lithium hydroxide in its pilot plant. Q1 2016 pfs due. The deposits are huge. or http://www.pilbaraminerals.com.au/ Pilbara is also developing a world class Tantalite-Lithium resource at its 100% owned Pilgangoora Project located 100km south of Port Hedland. I have been looking at all the Telsa battery cost reduction plans in great detail. The path FWD for the giga-factory was all based on cost reduction, looking at the location of the factory and where the closest deposits of lithium are would put us looking at the old lake bed of the salt flats in Utah. MESA Uranium acquired Lithium Brine Filed in Utah, check them out (TSX:MSA). If I were Musk, I would be looking for a supplier with on time delivery and low cost passed on from reduced shipping requirements, Musk also wants to create jobs in the USA!!!!. Thank you for the critical commentary John. Show us a way to invest in lithium and we’ll place a bet alongside you. It’s not that we don’t believe lithium has potential, it’s just that there doesn’t seem to be a pure-play way to invest in lithium at the moment! Buying all three lithium mining stocks that dominate 90% of the market with no more than 11% of revenues coming from lithium means you are placing 90% of your bets in everything but lithium. A quick look at Australia show about 7 lithium mines, with two heading up. De-bottle necking plant continuing and output continues growth toward break even and nameplate, the former helped by significant rises in prices globally for Lithium. Huge measured resource base And in pond reserves, significant recent reduction in sovereign risk with new pro-investment and mining new government as well as improvement in monetary policy which has significantly reduced local costs and removed various financial impediments that improve foreign investment opportunity. Ok it dabbles on the side in Borax due to purchase and relocation of an old RIO asset… But by enlarge coming online as we speak with low cost 17000 tpa Lithium mine. Price has risen rapidly with all the above factors and has recovered a lot of ground lost due to early days in bringing production on line ( Li is everywhere but bloody hard and expensive to recover) . 70+% SP increase alone since early December on good volume. What is your learned opinion on this Argentinian based Aussie miner… Oops industrial chemicals company? In Australia these Lithium stocks have returned 100%-300% in just 6 months at a time when the general market is falling, ASX ( Australian Stock Exchange) codes – LIT , PLS, GXY . NMT is up 500% and EMH up 400% . Seems a junior miner is a good bet. According to evidence seen by me, each battery contains several times more graphite in it, than Lithium. Suggesting that graphite miners might be a better bet. In North America, the best option seems to be Northern Graphite, (NGC) who have a huge area to explore in Quebec, which by all accounts, is a huge resource of large flake graphite, which apparently commands a premium with certain companies. Anyone who is interested would be well advised to do LOTS of research first. That said, graphite might become a critical element in the revolution taking place in graphene production too… And they’re already making great strides in finding new uses for the substance. – Expect it to appear in cars, planes, and trains before too much longer. While I agree the Tesla story would make one consider investing in Lithium the real story is NOT Tesla at all. The REAL story is the widespread adoption of driverless electric vehicles. This trend is as unstoppable as personal computers in the 1980’s …. it is coming and faster than you think. The power source is Lithium Ion batteries. So yes Tesla demand will whet ones appetite for Lithium but the real kicker will come when Toyota, Ford, General Motors, BMW are making electric vehicles as their mainstream product. Tesla is a very small player in the automotive market. If this small player can create speculation about lithium demand just wait until every vehicle in the world is using them. In Ontario, Canada the Government is pushing hard to reduce Provincial greenhouse emissions. It has already phased out coal as a source of energy for power plants. We have burnt our last lump of coal in Ontario. The next step is electrification of railway transport and electric vehicles. When the efficiency of driverless vehicles is added to the electric battery powered car together with a near zero emissions electricity generation system you have a modern society operating with no fossil fuels. Unfortunately this trend is going to create large scale unemployment since the number of components in an electric car is far less than that of a gasoline powered vehicle. But, like it or not, it is coming and by 2020 you will start to see many of these vehicles on the road. 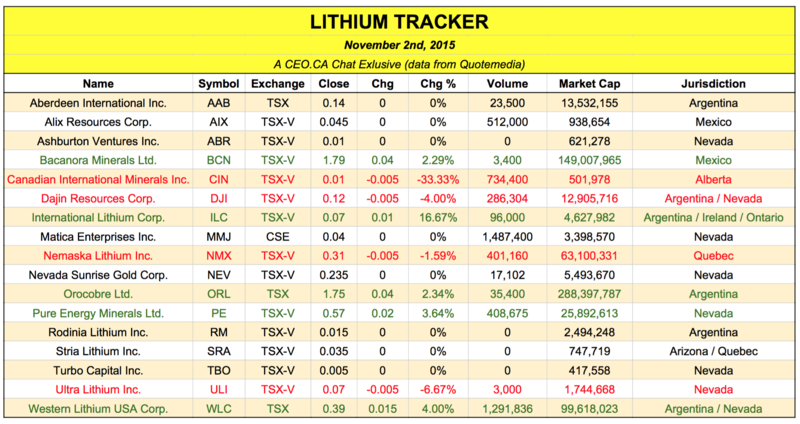 When you have the big auto makers buying Lithium by millions of tons a month…then you will see lithium stocks move. As someone here says…it is all about supply and demand. Right now demand equals supply. When the big guys start buying that equation goes rapidly out of balance. Not there yet but it is coming. Just a matter of time. That is what happened when Palladium and Platinum were required for exhaust emissions controls. I would be shorting those metals as demand from auto makers will drop off a cliff when they start to make electric cars that don’t have exhaust systems. And the rest of the story….being from Ontario….the government got rid of coal fired power plants and electricity rates are now outrageous! Electric cars in there present form wont work in Canadian winters. Even The new Tesla 3 with 200 mile range wont get you from Toronto to Ottawa on one charge during a typical winter day. Don’t believe the hype. A long way to go with electric vehicles. Thank you for the comment Darryl. When shares of Peabody Energy (NYSE: BTU), the world’s largest private-sector coal company, are down 96% in one year, that should tell you something about the future of coal generated electricity. Altura mining (AJM) in Australia has a spodumene deposit close to the Pilbara (PLS) spodumene deposit.. I bought Orobocore, Altura and Pilbara last year, Altura is up 500% Pilbara about 150% and Orobocore is down by about 30%. Neither PLS or AJM have dug up any Lithium yet but they recently issued announcements of deals with buyers. Orocobre makes lithium by evaporation of salts. I agree, and it is early days yet. We are making only a few tens of thousands of vehicles a year that are electric. When tens of millions are being made these lithium producers will replace the coal mining companies which are steadily going out of business. The other facet is home power storage batteries. I believe that these will become mainstream over the next 10 years or so because thaey will be able to replace the peaking power plants (mostly natural gas or coal fired) which must run very inefficiently for just a few hours a day to supply the grid peaks. With Tesla battery packs (lithium ion batteries again) all that changes. Grid peaks will disappear along with the peaking power plants that supply them. The grid will be almost all base load…the peaks being picked up by stored power in peoples homes and places of work. It is coming – fast. I think this is a very poor article on the future of Lithium investing , I have been invested in lithium for 5 years now . I have made money and increased my share holdings by timing the market . The stage has changed since 2015 . I m up 65% for 2016 and still climbing!. Now is a opportune time to get in. Lithium prices have tripled since this article was written lithium carbonate sells for $10,000 – $13,000 per MT. Mostly Chinese driven. world wide Demand is out- pacing the supply. There is not enough lithium to supply the growing consumer market. New Mines will flourish until prices stabilize in the next 5-10 years . Hi John. Thank you for your feedback. A key reason for this is that lithium only contributes 11% of revenues for SQM so the actual exposure you get to lithium is very small. For FMC the exposure is even worse. Lithium sales contributed just 6% to FMC’s revenues. ALB fares slightly better with lithium contributing 13.6% to total revenues. Because these 3 companies produce 90% of the world’s lithium but have so little exposure to it, we would guess you have been invested in junior mining companies and not the 3 majors we mentioned in the article. Junior miners are notoriously risky being subject to hype, stock promoters, and large amounts of capital needed for risky projects. It sounds like you have done well though so congratulations! The fact remains though that for now, 90% of the world’s lithium is produced by 3 companies that are far from “pure play”. I just published a blog on Seeking Alpha which referenced this article….obviously I have the benefit of hindsight, but I used the benchmark of August 2015 when this article was published against the gains that stocks like Nemaska and others have seen. I just did a quick (ok, not so quick) review of south am. Producers on your Li jr’s list, and the only one seems to have all their T’s crossed and I’s dotted in terms of DFS, gov’t approval, enviro studies completed, JV with a major… is TSE:LAC. Is there something holding this one down? Looks like a conservative 1.20-1-35 at current Li prices (expected to double?) Or is there a bottleneck somewhere? Anybody familiar with TSE:LAC? Agree with previous comments, heard this all 3-5yrs ago, still could be too early. Could make a lot better use of my money than sitting on it for 5-10yrs. With LAC as of May 15th there was outstanding short interest of 1.6 million shares….less than 1% of the issued, so not a big amount relative to the float, but still significant imo. I point this out because you asked if there’s a bottleneck or something holding it down….my opinion is that there are players using short selling in an effort to “shake the tree” stomping on the climb to try and inject some fear and/or uncertainty into retail longs ….the object being (if I’m right) to encourage some selling with those behind the short selling looking to cover off and add to a long position. Thanks for the details, great point, looks like the bulls stamped on some bear-tails the last few days! Straight off their own website. RocksinRollers…I think there are a lot of Jr. Lithium companies right now riding on little more than hype, LIX seems to pop up everywhere on IR advertising type sites. Looking at current price as of today $22.13 , does seems you were completely wrong in your assessment. Not sure what you are referring to but if it’s the price of the Lithium ETF (LIT) which is at $22.20, it’s actually sunk to a 5-year return of -50% compared to -38% when the article was written. What about Galexy resources ltd that went from 1 cent to .36 and went up upto 36,000%. that is amazing. Yeah, great advice. LIT is trading at almost $24 as of 5/25/16 and index funds have been down over the past 9 months. The point about LIT is that it isn’t actually a pure play on lithium but rather a scattered collection of companies that are involved in lithium in one respect or another. Many are buyers of lithium. If I use lithium as an input, and the price of lithium goes up, I am not better off. The recent increase of the LIT ETF, while not coming close to offsetting the historical losses of the ETF, is simply a function of hype. Would you see this differently? Almost 180 million OS and still waiting on a “preliminary” economic assessment….looks to me like they’re years away from being a Lithium “producer” if they ever even get there. Thank you for the comment John! I’m sure speculators will make money and lose money on many of the names mentioned. Be sure to check out the 500+ articles on Nanalyze that aren’t related to lithium as well! People need to understand that its a zero sum game, some people get shares….others get cash, and usually when a stock bubbles and then tanks, its retail investors left holding the bag. I just got a message on my blog from Ellis Martin about the “interview” he did with Nemaska…..
Wow! Confusing! But on the whole, it seems these stocks are for people who like roulette or poker (where at least you have some control). Where’s the crystal ball…? So glad I ignore the advice of so-called pundits. I bought in to the ETF on the back of the ‘ignore’ advice back then, and have so far made 250% – thanks! I’ve found a company in Australia Pioneer Resources that seems to be flying under the radar with regards to its positioning in Canada for high grade Spodumene with a company called international lithium who is also backed by Ganfeng China. Pioneer also has lithium tenements in Australia. Check them out would love some feed back on peoples thoughts…. International Lithium (ILC.V) I’d hardly call this one “under the radar”….in 2015 it was trading in and around 2 pennies, now its up around 20. I think this is a great article, because whether you’re right or wrong, you’ve created some great discussion! Wow did you get it wrong and your chart is not right either. Price of the NYSEARCA:LIT was over $17 at the time you published. Thank you for keeping us on our toes. Did you notice the stock split on November 18th, 2015? We replied to you via email! I don’t agree with your stating that Lithium is not worth investing in. Attached is an article regarding a jr. lithium miner. Take a look and let me know what you think? We never said we didn’t think lithium was worth investing in. If you read the article then you should already have an idea of what we think.